Solr is the popular, blazing fast, open source NoSQL search platform from the Apache Lucene project. Its major features include powerful full-text search, hit highlighting, faceted search, dynamic clustering, database integration, rich document (e.g., Word, PDF) handling, and geospatial search. Solr is highly scalable, providing fault tolerant distributed search and indexing, and powers the search and navigation features of many of the world’s largest internet sites. Just go to this link and download below Solr 7.0.0 version. Select the preferred file, we recommend you to download “Solr 6.4.2 version”. We are assuming you’re installing this on Windows. Extract the downloaded file somewhere and give the folder name as you want, (Assuming you extracted it to “C:\” drive and gave folder name “Solr”, So your Solr path becomes “C:\Solr”). Go to this link, Download latest Java Version, and Install Java. You can choose the version as per your system requirements but we prefer “Windows Offline (64-bit)” setup. (a) How to check JAVA path? After successful JAVA installation, it’s time to define the “JAVA_HOME” Environment Variable which will helps Solr 5.0 to find the JAVA location. Here, we have installed Java Version 7 (Windows 64 bit) so we’ve entered C:\Program Files\Java\jre7. Before adding “Variable Value”, make sure you’ve checked your installed JAVA latest version by go to C:\Program Files (x86)\Java (Windows 32 bit), or C:\Program Files\Java (Windows 64 bit) and replace the “jre7” with your directory name. For example, If your directory name is “jre1.8.0_40” under above path, your “Variable Value” should be C:\Program Files (x86)\Java\jre1.8.0_40 (Windows 32 bit), or C:\Program Files\Java\jre1.8.0_40 (Windows 64 bit). Click OK, you will see the newly added Variable name “JAVA_HOME” in the list. To stop the server, same thing you need to follow but slide change in command. To restart the server, same thing you need to follow but slide change in command. To create new core, Solr instance must be running on specified port (For example, we are running Solr on 8983 port). Once your Solr Instance is running, all you need to do is write the simple command and core will be created automatically by executing following command. Here, “-p 8983” represents Solr Instance running on port 8983. You can change this port if needed. It is very important to configure Solr correctly before you proceed with using nopAccelerate Solr Plugins for your nopCommerce store. Decide Core you’ll be using for your application. You can either create new Core or use default Core created during installation. Hint: A Core, also referred as Solr Core, is a running instance of a Solr index along with all of its configuration (SolrConfigXml, SchemaXml, etc…). A single Solr application can contain 0 or more cores which are run largely in isolation but can communicate with each other if necessary via the CoreContainer. If you have default Core created during installation, then skip Step 3 else Create new Core for Integration. 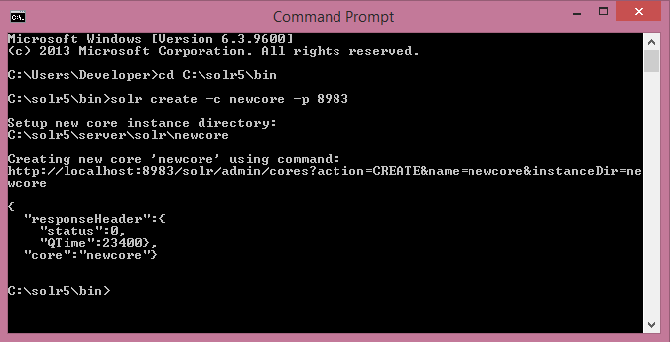 We’re creating a new solr core named as “newcore” to illustrate the steps involved in creating new solr core. You can name it whatever you like. Now, copy schema.xml, solrconfig.xml, elevate.txt, mapping-FoldToASCII.txt, and mapping-ISOLatin1Accent.txt file provided with nopAccelerate Plugin to replace existing file at C:\Solr\server\solr\newcore\conf\. 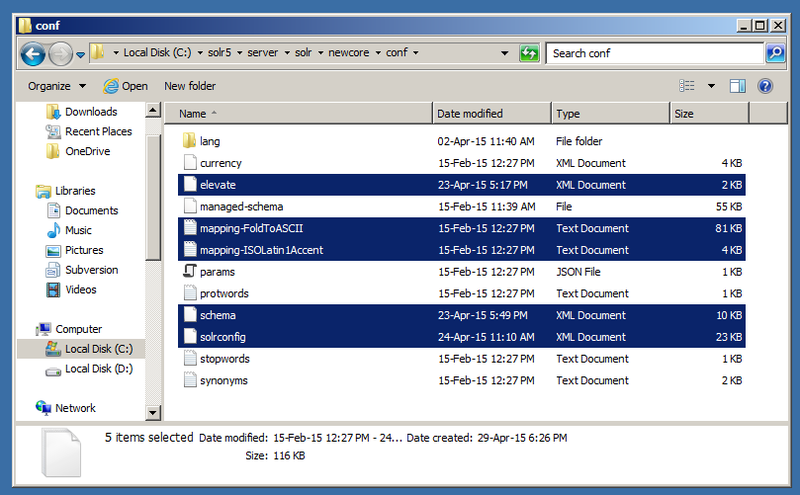 Note: You need to delete managed-schema File from C:\Solr\server\solr\newcore\conf\ directory if exist. To check core is created successfully or not by go through http://localhost:8983/solr/#/newcorethis link. Replace your core name if you have created core name other than newcore in above URL. 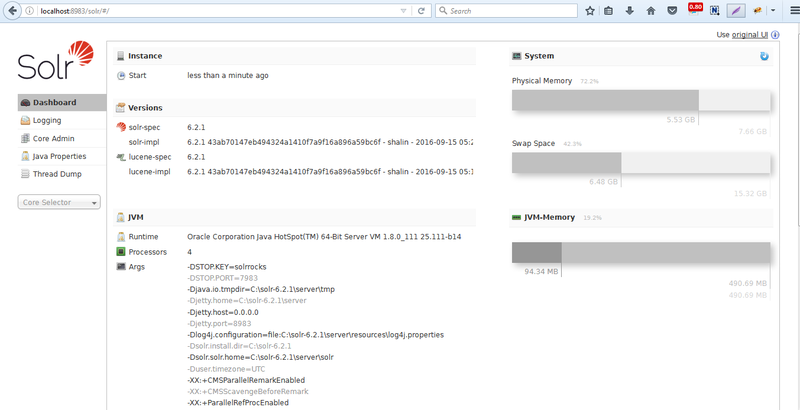 Your Solr Core is now ready to be used with nopAccelerate.